A close-up of the northwestern ice-sheet margin in Inglefield Land. 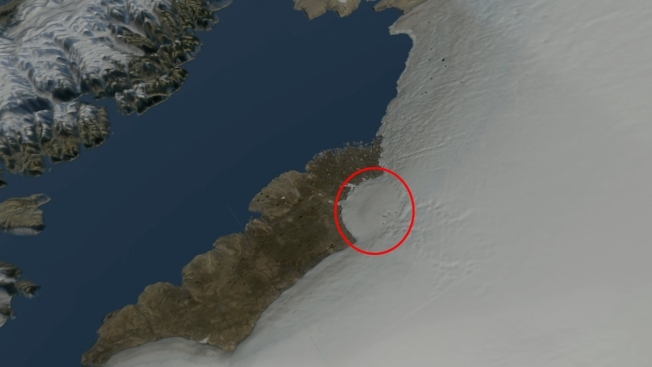 Scientists say an impact crater bigger than Washington, D.C. is hiding beneath more than a half-mile of ice in Greenland, NBC News reported. The crater, which would be the first ever discovered under a continental ice sheet, is more than 19 miles wide and 1,000 feet deep. Researchers believe it formed "after ice began to cover Greenland, so younger than three million years old and possibly as recently as 12,000 years ago," Kurt Kjaer, a professor at the Center for GeoGenetics at the Natural History Museum of Denmark in Copenhagen, said in a statement. The researchers first spotted evidence of the crater in 2015 when they noticed an unusual feature on a topographical map made from data obtained by NASA aircraft that had surveyed the area with ice-penetrating radar. They spent the next three years confirming the discovery. Some scientists want more evidence to be convinced the feature is an impact crater from a meteorite.